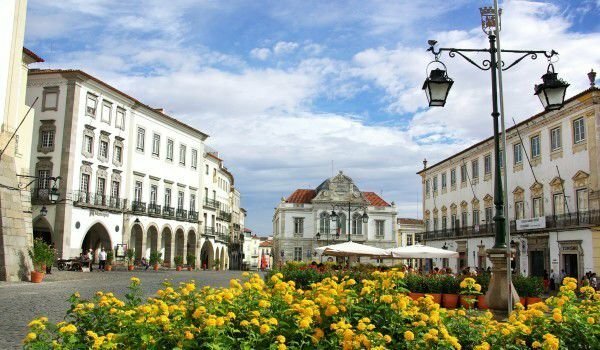 Evora is a jewel in the treasure trove of historic Portugal. This city-museum, which is a unique architectural treasure is located 140 km southeast of the Portuguese capital, and the Spanish border is pretty close from here too. 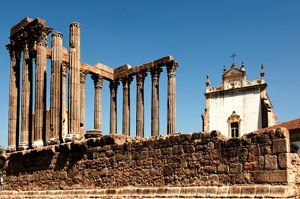 Evora is located in the southern part of the country in the area Alentejo. The most convenient way to visit the city, is to take the train or bus from Lisbon. Situated on a low hilly area, Evora is an excellent example of Portuguese architecture of the golden age. The reason for this is that the city remains largely unaffected unlike many other Portuguese communities after the big earthquake here in 1755. Because of the valuable buildings in the old town of Evora, which number about 4000, it is a monument of world heritage by UNESCO. Into the town is entered through a gate in the already very powerful and ancient fortress walls . There is a unique blend of cultural influences. There are Moorish, Spanish, ancient and medieval past traces left here. The village has existed for 2000 years now, at one time was part of the Roman Empire, had the name Julia Liberalitas. From these distant ages an impressive aqueduct and the ruins of a Roman temple have managed to survive. After centuries of Moorish influence, in the 12th century, follows the high Medieval period of flowering of the city. There were several se of the Portuguese rulers that were based here. From the Roman Emperor quite an interesting temple is left behind, which is preserved like a monument in the country. It is dedicated to the goddess Diana, and today, an impressive 14 Corinthian columns, and part of the entablature can be seen remaining. Opposite the temple lies the exquisite Gothic church "Santa Evangelista". It was built in 1485 and after less than three centuries it has been refined with unique beautiful hand-painted ceramic tiles that are made by local potters. There is no way tours in Evora can omit the square "Vasco da Gama", and the central square “Prasa”. And there's cathedral, named "Se", which was built between the 12th and 13th century, but its portal and arcades were added in the 14th century. In the 18th century within it- a baroque altar is placed.